Shot Works Pro gives you a great way to keep track of your firearms, ammunition, accessories, performance, and maintenance in a very secure manner. All data is encrypted with password protected strong AES 256 encryption, and none of your data ever is sent over the Internet. Backups and restores of data make it easy to keep a digital copy in a safe for insurance purposes. Firearms - Purchase and sale information, condition, round counts fired through the weapon, and maintenance events. Ammunition - Track types, lots, and counts of ammo, and also tracks your reloading data for that ammunition if you hand load. Accessories - Scopes, slings, holsters, safety, cleaning equipment, and anything else. Maintenance - From cleaning to gunsmith work. 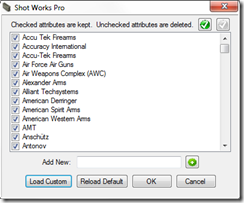 Reloading Supplies - Track components like powder, primers, and bullets. Scoring - Bulls eye targets to competition to hunting. The equipment used and shooting conditions are some of the trackable data you can store. Please view additional information on the Navigation menu on the right for more details. 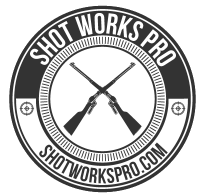 If you like this software and use Facebook, please click the Like button in the lower right hand corner, so you're shooting buddies can also give our software a try. 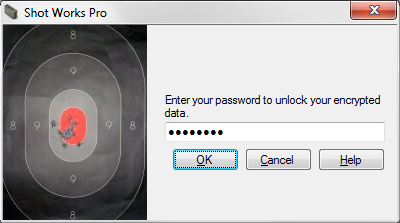 Log in using your password to unlock your encrypted data. The Inventory Table. 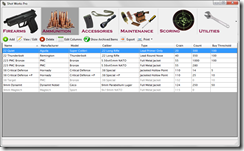 Columns may be customized and sorted for each type of inventory item. A Firearm Listing. Each item may have photos associated with it, including maintenance events. Items such as firearms may be assigned to people, and various items may be associated with other items, such as a scope to a particular rifle. 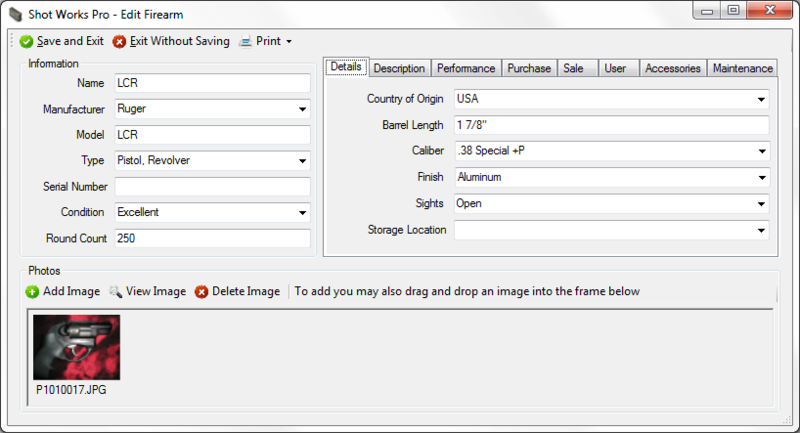 Customized Attribute Listing. 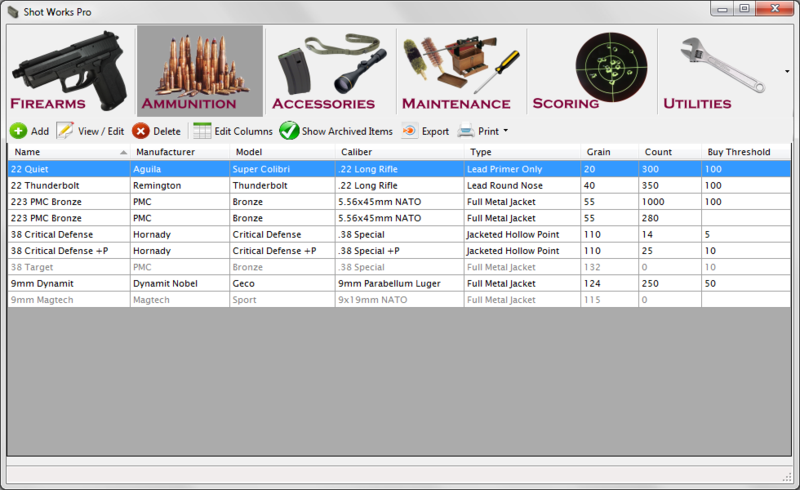 Easy pull down lists in the items give access to attribute listings such as manufacturer, caliber, weapon and sight types, and many others. Most of these lists come pre-filled with common entries, but you may always enter anything you'd like for custom entries.